"AC/DC are ending their 41 year career on a terribly sad note. About 3 weeks ago, founding member, rhythm guitarist, co-producer and co-songwriter Malcolm Young had a stroke, which left a blood clot on his brain. Right now, that announcement is expected Tuesday, April 15, and a press conference has been scheduled. The band have been written off by critics, numerous times, but they stuck to their guns and beliefs and never compromised their sound. They were rarely, almost never, tempted by the musical fades that came and went over the decades. They dabbled in glam rock at the start of their career, but that barely lasted through the recording sessions of their debut album. Their fans wanted rock n roll, heavy rock, they could rely on, and that's what AC/DC delivered, across more than 14 albums, and numerous live-in-concert releases." 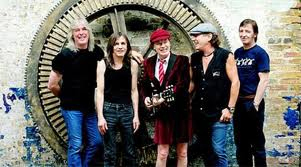 "After forty years of life dedicated to AC/DC, guitarist and founding member Malcolm Young is taking a break from the band due to ill health. Malcolm would like to thank the group's diehard legions of fans worldwide for their never-ending love and support. In light of this news, AC/DC asks that Malcolm and his family's privacy be respected during this time. The band will continue to make music."